I have been having more and more calls from landlords inquiring as to what they can and cannot do when the tenant indicates that their “pet” is actually their “service animal” and that the landlord cannot charge a deposit nor deny a tenancy based upon the service animal. If you are looking for a bright line it is can be difficult. There is a strong opinion by the disability community that landlords are discriminatory in this area and have been going out of their way to hammer landlords both financially and legally. Generally speaking if you adhere to their position one would be hard pressed to fault you. Keep in mind that this is an overly tenant friendly position. What the actual law would hold may very well be different as these situations rise and fall on very specific fact patterns. You need to consult with your own legal counsel before making any legal decisions relating to denials based upon pets/service animals. Q. What is the law that applies to non-discrimination and Service Animals? The Washington State Law Against Discrimination prohibits unfair practices of discrimination against a person with a disability who uses a trained dog guide or service animal. The State Human Rights Commission was created to eliminate and prevent discrimination in employment, in credit and insurance transactions, in places of public accommodation, and in real property transactions. It is considered an unfair practice to fail to reasonably accommodate a person with a disability who uses a trained dog guide or service animal. • is perceived to exist. Q. What is a dog guide? “Service animal” means an animal that is trained for the purpose of assisting or accommodating a disabled person’s sensory, mental, or physical disability..
Q. What does a dog guide or service animal do? Guide dogs are one type of service animal, used by some individuals who are blind. 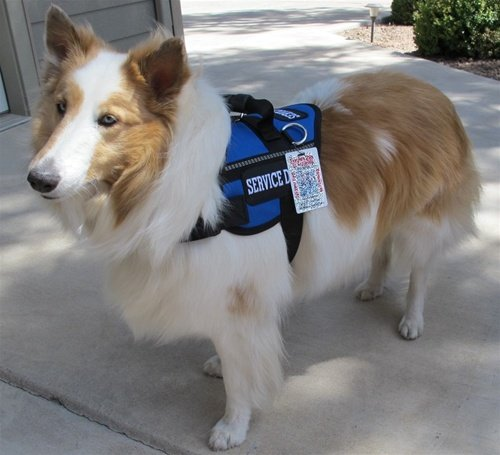 Service animals can perform myriad services for someone with a disability, including alerting deaf individuals to sounds (telephone, doorbell, fire alarms), alerting an individual with seizure disorder to an oncoming seizure, carrying and picking up things for someone who uses a wheelchair, and assisting with balance and opening doors. There are no legal requirements for service animals to be specially identified. Some, but not all, service animals, wear special collars and harnesses. Some, but not all, are licensed or “certified” and/or have identification papers. If you are not certain that an animal is a service animal, you may ask the person who has the animal if it is a service animal required because of a disability. A public entity cannot require any proof of a person’s disability, or identification or certification of the service animal’s status. A housing provider may ask for a health care professional’s statement that an individual is a person with a disability and will be assisted by a service animal. A housing provider may not ask for details or the nature of an individual’s disability. Q. Can we restrict areas into which the service animal can go? Generally, no. The service animal must be permitted to accompany the individual with a disability to all areas of the facility where members of the public are normally allowed to go, unless its presence or behavior creates a fundamental alteration or direct threat to safety. An individual with a service animal may not be segregated from others. Q. What about any “no pets” policies? Legally, a service animal is not a pet. You are required to modify your “no pets” policy to allow the use of a service animal by an individual with a disability. A “no pets” policy may be continued, but you must make an exception to your general rule for service animals. Q. The county health department has told me that only a guide dog has to be admitted. If I follow those rules, am I violating the Law Against Discrimination? Yes, if you refuse to admit any other type of service animal on the basis of local health department regulations or other state or local laws. There is no evidence that healthy, vaccinated, well-trained service animals are any greater threat to public health and safety than members of the general public. Health Department rules that apply to certain animals in food processing areas will, however, be considered on a case by case basis. Q. Can I charge a maintenance or cleaning fee, or safety deposit for customers who bring service animals into my business? No. As for any other program modifications provided to people with disabilities, you may not charge an additional fee related to the use of service animals. An agency may charge its customers with disabilities if a service animal cause damage so long as it is the regular practice of the entity to charge non-disabled customers for the same types of damages. Q. Am I responsible for the service animal while the person with a disability is in my business? No. The care or supervision of a service animal is solely the responsibility of his or her owner. You are not required to provide care or food for the animal. Q. What if a service animal barks or growls at other people, or otherwise threatens people or other animals? You may exclude a service animal from your facility when that animal’s behavior poses a direct threat to the health or safety of others. However, you may not make assumptions (speculate) about how a particular animal is likely to behave based on your past experience with other animals. Each situation must be considered individually. Although an agency may exclude any service animal that is a direct threat to safety, it should give the individual with a disability who uses the service animal the option of continuing to enjoy its goods and services without having the service animal on the premises. Q. Can I exclude a service animal that doesn’t really seem dangerous but is disruptive? There may be a few circumstances when an agency is not required to accommodate a service animal –for example, when doing so would result in a fundamental alteration to the nature of the business. For example, when a dog initiates unsolicited contact with people other than its owner (jumping on people, sniffing them, trying to be petted, etc..), the animal can be excluded. Any exclusion must be for reasons that are demonstrable, not speculative. Q. Must I let in a service animal in training, or a person who does not have a disability who says the animals is trained as a service animal? No. The Washington State Law Against Discrimination does not address service animals that are not trained. While you might choose to allow these animals entry, you do not have legal obligations to do so. Additionally, the State Law Against Discrimination protects the rights of individuals who have disabilities and are assisted by service animals, and does not pertain to non-disabled individuals who have service animals. or Delta Society National Service Dog Center, HYPERLINK “http://www.deltasociety.org/“www.deltasociety.org, 800-869-6898. U.S. Dept. of Justice civil Rights Division, Office of the ADA, Commonly Asked Questions About Service Animals (1996).